Tracey and I often wonder what leads someone to abandon a pet. We just can't imagine ever giving up our own furry children. And that's why we can't for the life of us understand why someone abandoned sweet Teal in PAWS' parking lot back in October. This beautiful and petite grey and white tuxedo girl had obviously belonged to someone, so we're sure it was overwhelming for her to be left outside, then thrust into a shelter situation with so many unfamiliar sights, sounds and smells. 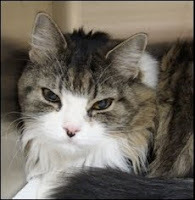 Sweet, but shy Ally (pictured above) was adopted by one of our friends, who has re-named her Priscilla. Our friend reports that Priscilla is adjusting well to her new surroundings. She stays close by when her new mommy is doing things around the house, and sleeps with her every night! Carrie & Sweetheart ... A Couple of Golden Girls! Carrie and Sweetheart are two kitties who have touched our hearts. Originally adopted ten years ago from PAWS, Carrie (the tabby and white beauty) was brought back to us because, sadly, her owner is moving. This gentle soul enjoys being pet and loves to play with a squeaky mouse toy that was given to her by a PAWS volunteer. Although Carrie ventures out into the room every now and then when her cage is open, she seems to feel safer within its confines. She's still a bit overwhelmed by the whole shelter experience, but we're sure she'll blossom once she's in a home of her very own. Carrie is 11 years young and front-paw declawed. We love these little girlies and can't wait for them to be placed in their furever homes! Sometimes volunteering at an animal shelter can be absolutely heartbreaking. This is one of those times. Today is a sad, sad day for the cat volunteers and staff members of PAWS. We received word this afternoon that Pharaoh -- a sweet and gentle kitty we wrote about in September -- passed away early this morning. This charming fellow had become very ill, and was recently diagnosed with kidney failure. He was taken to a local animal hospital several days ago, and was scheduled to undergo further diagnostics and supportive procedures today in hopes he would get stronger, feel better, and be able to come back to us. Sadly, our Pharaoh was too ill and didn’t survive. Our wish is for all PAWS animals to be adopted to live out their days with homes and people of their very own. While that didn't happen for Pharaoh, it's comforting to know that PAWS' strict no-kill policy meant our sweet friend was in a safe, warm and loving environment for the final months of his life. We love you and miss you, Pharaoh. Rest now ... we'll see you later at the Rainbow Bridge.